Erin’s is high in fiber and “about half the bag” is merely 300 cal. Whew! 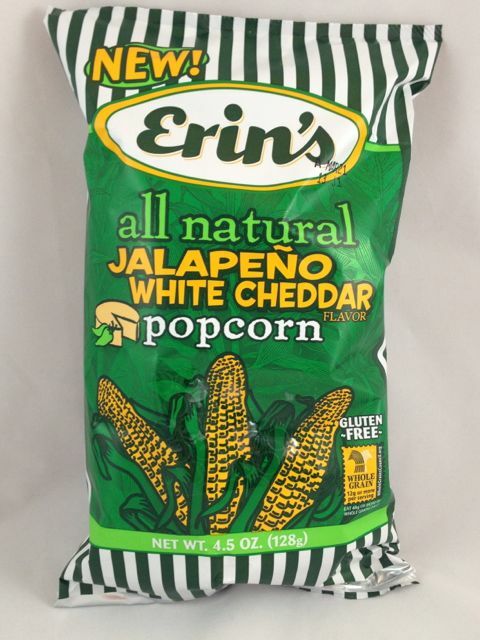 Erin’s also advertises on the back panel that their popcorn is a great choice for healthy snacking. Erin’s is manufactured by the same company that makes Tim’s potato chips. Tim’s offers a jalapeño flavor as well, but I’ve never been brave enough to try it. I’m a whimp when it comes to hot food. Jalapeño and white cheddar are the perfect combination. The flavor reminds me of really good nachos. The cheese flavor balances the heat perfectly.Erin’s jalapeño popcorn is extremely spicy and hot and my mouth burns, but it’s tolerable. Ingredients include (in descending order): popcorn, vegetable oil, whey, cheddar cheese, pasteurized milk, salt, cheese culture, bell pepper powder, buttermilk solids, onion powder, natural flavors, jalapeño powder, garlic powder, non-fat dry milk, lactic acid, and whey protein concentrate. The artificial, overpowering bell pepper flavor note (iso-butyl-3-methoxy pyrazine) is not present. It seems that Erin’s uses bell pepper powder and jalapeño powder for the jalapeño flavor. Capsicum oleoresin, which is extracted from hot chillies, is most likely the natural flavors. Capsicum gives the popcorn the “bang” and contributes the heat. 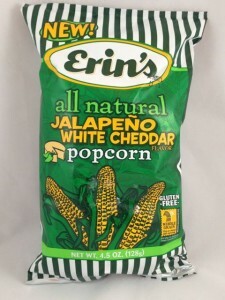 I found my bag of Erin’s at the local Albertsons. Those of you not living in the Pacific Northwest, may be unable to find this treat. I’m sorry, because this popcorn is amazing. I am in awe.